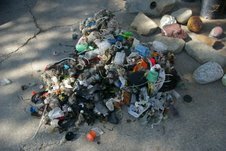 With Neptune’s Vomitorium becoming active once again, after a six month quiescence, I’ve been making twice weekly trips to Invisible Beach to gather its bounty. 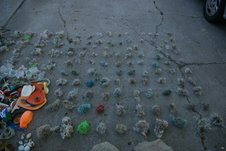 My previous record for collecting fishing line balls at one time was barely half that. Whether I can find the time to tie all of them, along with the several thousand others I’ve got stored, to the World’s Largest Fishing Line Ball, remains to be seen. In a follow-up visit yesterday, I found what I call a “smoking gun,” or in this case a flapping flag. 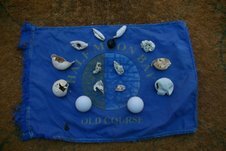 I’m referring to my golf ball remnant collection’s source. 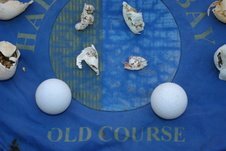 In my previous stories about Invisible Beach and its unnatural oddity, Neptune’s Vomitorium, I detailed my tracing the origin of the golf balls and remnants I was finding there, back to the Ritz Carlton, particularly the 18th hole of “The Old Course.” I think these pictures offer strong evidence that I was right.